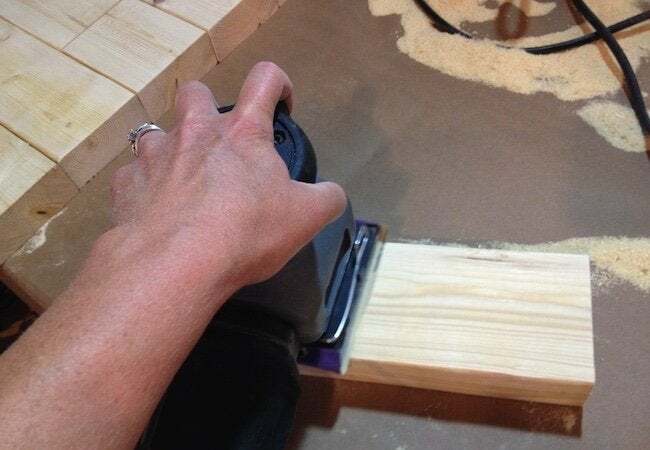 Use up scrap wood—and your free afternoon—building a simple tabletop from 2x4 lumber. Want to make it memorable? Apply not one, but a trio of stains. Then protect the finished wood from weather and wear with a urethane sealer. 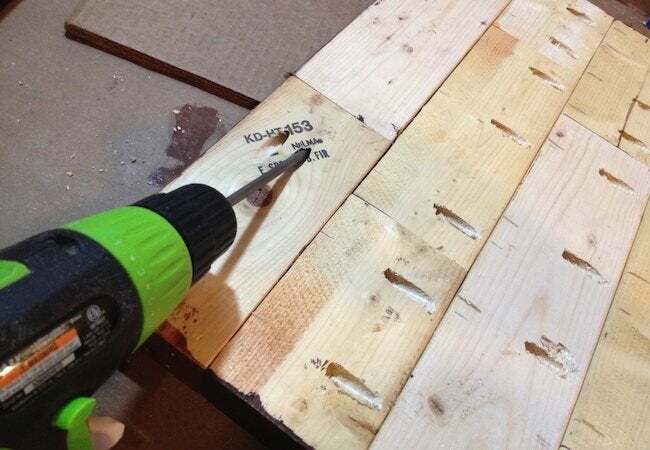 This DIY has a bit of a backstory: In my basement workshop—as a byproduct of about a half dozen previous projects—I’d managed to accumulate a small mountain of scrap wood. 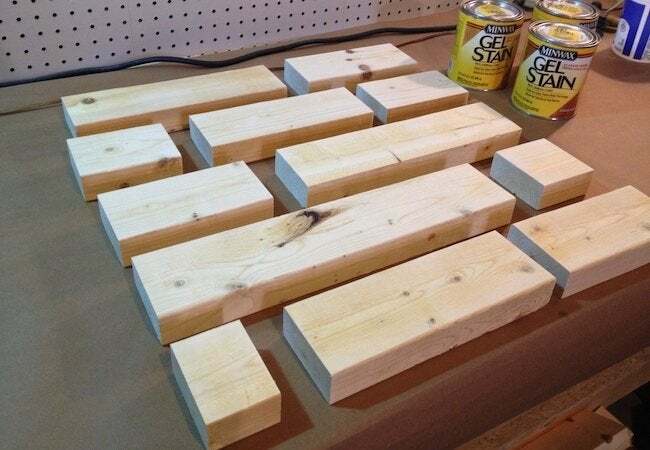 Though the pieces varied in size, most were 2×4 boards. For weeks, I pondered the question of how to use them. There wasn’t enough material to build anything substantial, but at the same time, this was much more wood than I would feel comfortable chucking or committing to kindling. I suddenly seized on the idea of turning those leftover boards into a rustic tabletop, but then I let the project momentum slow to a creep, and in the blink of an eye another few weeks had gone zooming by. Things finally came to a head one day when I was scanning the local giveaway listings. There, I discovered that one of my neighbors was trying to get rid of an old metal garden table. Upon seeing the pictures, I knew immediately that this would be a great table to top with the scrap wood surface I’d been planning to make with all those 2x4s! Now, the project starts to get really interesting. While I knew that I would use pocket-hole joinery (my latest obsession) to assemble the tabletop, I couldn’t decide how to finish the wood. There were three different cans of Minwax Gel Stain on my shelf, in three different colors—Hickory, Cherrywood, and Honey Maple. In my head, I could make a credible argument in favor of each one. And though it would have helped to know where the table would eventually go, that was another question I couldn’t answer. Then it hit me: Rather than choose one stain, why not use them all? After all, I was constructing the tabletop from scraps, so it was going to have a homemade, mosaic look no matter what. In the end, using multiple stains would emphasize the rustic effect the table was going to achieve. Perfect! From there, having fought my way to a project plan, the rest came easy. 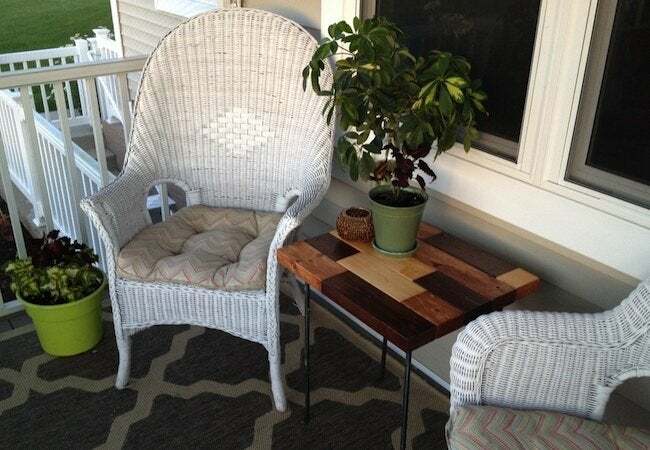 Read on to see how I built the tabletop, then stained and sealed it with Minwax. Before doing anything else, I measured the metal garden table to figure out what size the tabletop would need to be. With those dimensions in mind, I went hunting for scraps. Somewhere in my collection, I was able to find the right combination of 2×4 boards to cover the measured surface area. (Note: If you’ve got a large, motley assortment of wood, you might find it painstaking to cull the pile and piece together suitable boards. To make quicker work of the process, I suggest cutting a template out of cardboard and using it to test different arrangements.) For my part, starting with five 2×4 boards, all roughly the same length, I had to make just a handful of cuts with the circular saw to end up with exactly the right amount of material. In the above photo, those dozen smaller pieces may seem haphazardly strewn about, but when combined, they fit together perfectly to form a tabletop of the desired shape and size. If you don’t intend to finish the wood, you can probably safely skip this step. But for me, it was crucial to sand each board, not only to ensure a level tabletop, but also to give the stain a surface to which it could easily adhere. Of course, no matter how much sanding you do, some woods (2x4s included) are not milled for finish work and may never get totally smooth. But that was fine with me, as I figured that any imperfections that remained in the end would work to underline the rustic quality of the piece. It was in that same spirit that, in the process of sanding the boards (with fine-grit paper, always in the same direction), I opted not to sand down a few of the chatter marks left by the sawmill. I knew the stain would take to the wood a bit differently in those spots than elsewhere, lending the tabletop a further layer of charm—or so I hoped. Once I was done sanding, after thoroughly cleaning each board with a moist tack cloth, I let enough time pass for the wood to dry out completely. I had been looking forward to this part—applying the Minwax Gel Stain. First, I tested the stains on a leftover board to confirm my suspicion that, used together, the three stains would complement one another perfectly. When the test confirmed my suspicions, I proceeded to stir each stain until it developed a creamy, smooth consistency—nothing like the watery liquid you might be used to. 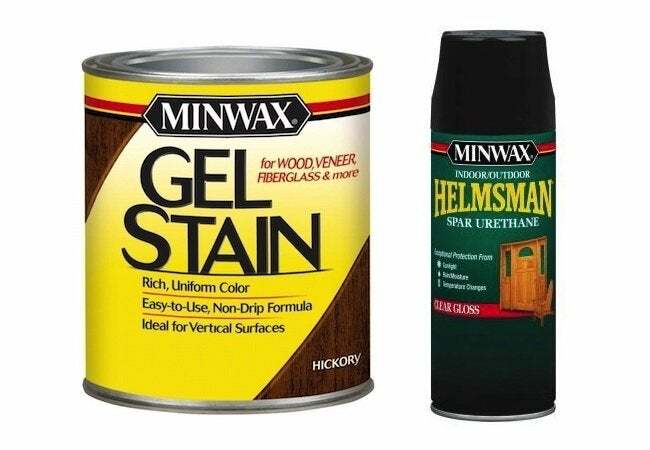 With its thicker formulation, Minwax Gel Stain has been specially designed to be user-friendly and easy to apply. 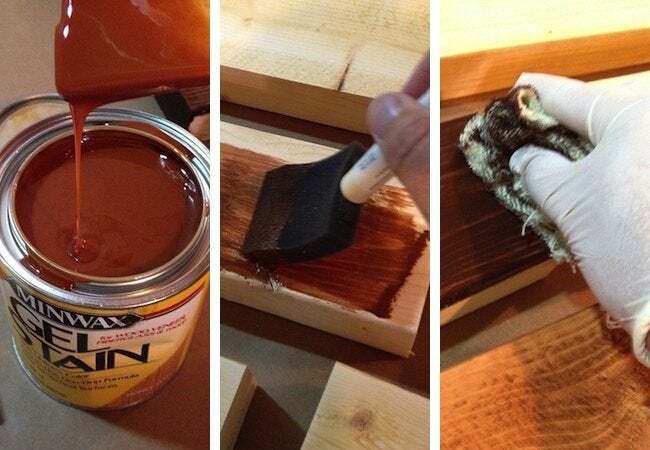 With either a foam brush or a rag, the Gel Stain goes on in a controlled way, and you don’t have to worry about drips; just let it sit on the wood for about three minutes and wipe away the excess with a rag. Once I had finished staining all the wood pieces in alternating colors—Hickory, Cherrywood, and Honey Maple—I let about eight hours of dry time elapse. Though it wasn’t strictly necessary, I decided to darken the stain colors a bit by applying a second coat, using the same technique I’d used with the first. With the stain dry, I began to build the tabletop. Others might have chosen to build first and stain second. 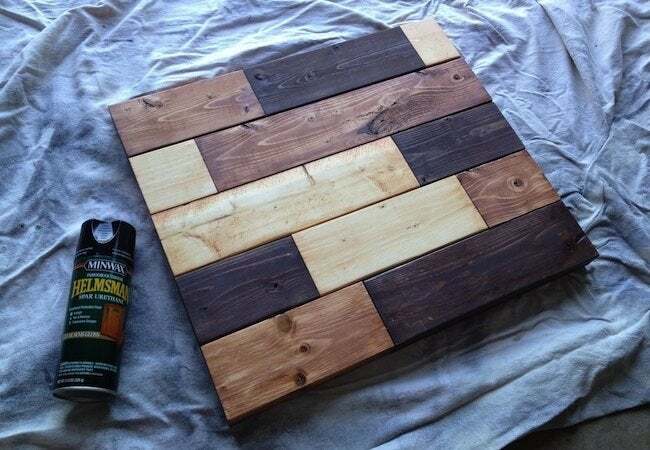 But I felt that, given the combination of colors being used, I was most likely to achieve satisfying results—or less likely to mess up—if I stained the boards before I joined them together. The picture above shows the unfinished undersides of the boards after I had almost finished fastening each one to its neighbors. First, I marked off where the pocket holes would be located. For each regular board, I planned to put in at least two pocket holes. I needed to put additional holes in the boards at the two long edges, because those boards would need to be secured not only to those in the adjoining row, but also to each other. Finally, after creating the pocket holes, I assembled the tabletop one row at a time, driving in the screws that magically brought the disparate pieces together into a cohesive surface. This post has been brought to you by Minwax. Its facts and opinions are those of BobVila.com.